The Times of India 26 July 2015 - PUNE: When Warje resident Vidya Kalel stepped into Ganesh Kala Krida Manch on Saturday, it was with a mission to solve her garbage disposal problem. For the past eight days, garbage generated by the six flats of her residential complex has been accumulating at the society's entrance. With the Pune Municipal Corporation refusing to pick up the waste, the residents have no option but to find alternative ways of disposing it. 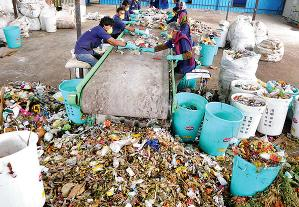 Kalel visited the two-day exhibition, organized by Pune Municipal Corporation, to see and understand the different technologies available to suitably dispose of garbage, especially...read on.